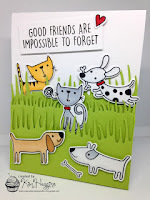 I'm on the SugarPea Designs blog today with a video showing how I made this card, inspired by Kim, for this week's Muse Challenge. Ardyth...this is just too darn cute!!! Amazing water for your otters to play in, Ardyth! Absolutely adorable card, Ardyth! I love all the texture...such a fun scene!